Sharon Jones & the Dap-Kings' final studio album, Soul of a Woman is a lush, orchestral masterpiece. A true testament to the life and career of Daptone's fearless leader and one of the world's greatest performers. In the year prior to her death from pancreatic cancer in 2016, Sharon Jones toured and performed tirelessly, and was also the subject of Miss Sharon Jones!, an acclaimed documentary by Oscar-Winning director Barbara Kopple. Yet somehow, the beloved and heroic soul singer found time to complete a studio album. 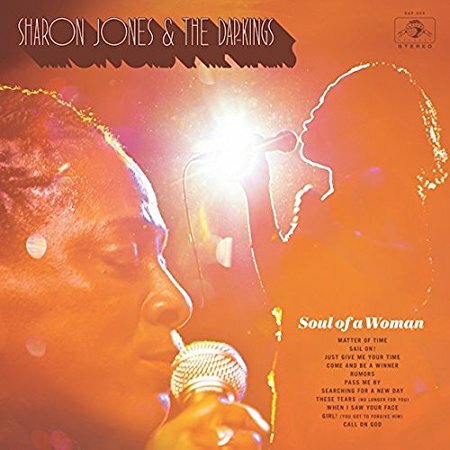 Soul of a Woman features eleven songs which reveal that the emotion, dynamics, and drama of Jones' voice remained at full power until her final days. The songs on Soul Of A Woman exemplify two distinct sides of the band s sound. Side One showcases the grittier, bluesier material like Matter Of Time and Sail On giving Sharon the room to flex her vocal prowess, creating a liveness that few studio albums posses. Side Two takes on a more sophisticated orchestral mood. Tracks like When I Saw Your Face and These Tears (No Longer For You), capture a soft vulnerability in Sharon's vocals that draws you deep inside, and yet they remain nuanced with the signature toughness that never allow you to forget she's steering the ship. The finished product is an album that captures a band and a singer at their peak. Includes download card.